Just when they may have thought it was safe to finally consign forever the painful memory of one spurned London lover, along comes another swapping West Ham United gear for green garb declaring unequivocal love for an adopted nation. Except this will not be one that gets away; not that Josh Cullen's allegiance will numb the pain of ceding Declan Rice, of course. But it's something to be going on with, one supposes. 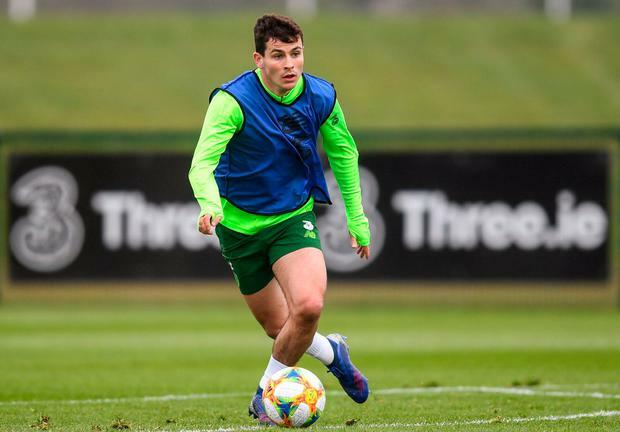 Ironically, Cullen's claims to an Irish heritage are much vaguer than his good friend and midfield team-mate but he certainly seems more determined than Rice to commit to Ireland under those infernally loose international eligibility rulings. Cullen, who turns 23 in a fortnight, declared for Ireland as an under-age player, firstly with Tom Mohan's U-17s, and did so in memory of his late grandparents who hailed from Leitrim and Black Lion (in Cavan, as opposed to the Black Lion pub, Bobby Moore's favourite haunt near Upton Park, the Hammers' former home). He remembers as a teenager being asked then what an Englishman was doing playing for Ireland - especially when as a 16-year-old he played for England - and the questions are still asked, notably in the context of Rice's recent strident commitment to fluid nationality. One wonders, too, if his surprise late call-up to a squad whose original 38 members excluded him may have prompted some banter beloved of Irish international teams. "I think everyone's situation is different. I'm fully focused on playing for Ireland. I think everyone who knows me knows that so it's been fine. "It means everything to get this call-up. As a young lad growing up you want to represent your country at the top level in the senior game. It's fantastic. To have captained the U-21s and to have played quite a few times for the U-21s was obviously a great feeling. "I was so proud to be able to do that but to get the first senior call-up and to get that feeling I had when I was coming in was top of the lot really. "My grandparents, Brigid and Owen, moved over from Ireland, they're my dad's (Anthony) parents. And although the accent is not Irish I'm as proud as anyone to be playing for Ireland." A proud Irishman, then, rather than a proud Englishman. "I'm here and I want to play. Whatever is going on outside of that, I want to play football so if I can play a part in these next two games then I will be delighted." Cullen and Rice are close friends as well as archetypal midfield maestros - they both featured prominently for the side that starred in an FA Cup tie against Shrewsbury 14 months ago, before winning their respective player of the year categories at age-grade level in the subsequent FAI Awards. Naturally, he doesn't reveal the substance of any conversation he had with Rice concerning his pal's wavering choice of international allegiance - indeed insisting there wasn't any specific chat - but he does reveal empathy. "Obviously Dec had that in his mind that he wasn't sure what he wanted to do. I just left him be. I spoke to him every now and then and we always have done. He drops me a message, I drop him a message but I didn't get involved in the decision, that was totally down to him. "He has made his decision now and so we wish him all the best, hopefully he goes on and has a successful career. Like I say, me? I'm totally focused on playing for Ireland. And hopefully, all the talk will be squashed when I make an appearance. Hopefully that will be in this break and then it will be done and dusted." The acceleration of his mate's career hasn't surprised him. "He's been fantastic. Surprised? Yes and no. I've always known that he was a great player, up through the academy. He got his chance and done well. He's so young so that's maybe a surprise, that someone so young is doing so well but he is doing so well but he is definitely got the talent. Full credit to him for delivering when he got his chance." If Cullen gets his, he is determined to take it; most Irish supporters, so slavish once their devotion is matched by those they cheer, will transfer their allegiance, just as Rice did his. Cullen is on loan with a Charlton Athletic side managed by Lee Bowyer, a former firebrand midfielder with a dash of class on the ball once beloved of West Ham. He spent three months out with a dislocated shoulder sustained in November which interrupted his attempt to seek a swift repatriation back where he feels he belongs. But he will bide his time, for now. "I'm happy with my form and this has been a good loan spell for me," he admits; he also had a spell with Bolton, albeit a step up in the Championship, and a decent run at Bradford. "West Ham are still happy with me and the manager was fully supportive of me last summer when it was time to decide if I would stick around and wait for a chance at West Ham or go out on loan and carry on playing." His confidence will surely be an asset. "I like getting on the ball, getting around the pitch, breaking the play up and keep things ticking over. "I just dominate the game and run it from the middle of the pitch." Rice is presumably a player Cullen would like to emulate, given their similar career developments. He is not a replacement though. Just a young man doing the best he can. Regardless of the fact that Cullen is an Englishman, born hard by the Hackney Marshes, once the spiritual home of Sunday League football in East London, and a lifelong West Ham fan too; fluid nationality flows both ways, too.